Tropes first documented after the emergence of broadcast television as a mass medium of entertainment (1940) until the rise of cable television (1980). Television had the fastest adoption rate of any media technology until the iPod. 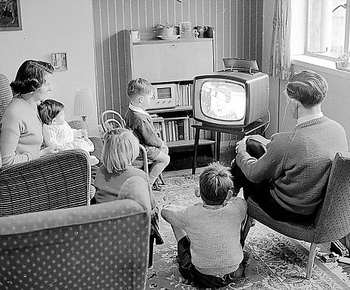 In the 1940s TV sets in the USA numbered less than 10 thousand, by the 1970s there were over 140 million.note And as of 2012, at least 302 million. The number of TV stations also went from 9 to 953 in the same time-frame. This rapid rise meant millions of viewers and millions of dollars in advertising revenue; which by 1950 were based on ratings generated from quarterly questionnaires, called "sweeps" for their staggered regional polling. Executive Meddling soon followed as Network Executives learned that only popular shows made money, with fiction being a big seller. Some networks like PBS and local news-stations are funded by donations from viewers instead, these tend to focus on non-fiction. The limited number of over-the-air channels and (initially) TV sets meant that audiences were not as niche and fractured as they are now. Any given show or episode could more easily become the talk of the country since more people were likely to have seen it. This in turn meant that there were limits on content "because children may be watching" — which was the source of late-night content restrictions, as that was when kids were supposed to be asleep. As on-screen content ratings didn't arrive until the 1990s, the Broadcast Standards and Practices (BS&P) during this time period was tougher than today and started the Editing [of Films] for Syndication. For more technical information and tropes in general, see the Useful Notes for Television. T.V. series also share many tropes with both radio and cinematic films, so be sure to check the Older Than Television index for tropes which TV may be famous for, but are Older Than They Think. See also The Golden Age of Video Games for video-games from this time period. Concert Film — Concert Magic, 1948note For feature films, anyway. Live musical performances were a popular subject for short films throughout the studio era. Conspicuous CG — Fantasia, 1940note Technically Conspicuous Live-Action back then, but the jarring contrast is more or less the same. The End of the Beginning — the phrase was coined by Winston Churchill in 1942. Raised Lighter Tribute — There are some reports of it at Woodstock in 1969. Audiences for the 1974 tour of Bob Dylan and The Band were the Trope Maker. Spider-Man Send-Up: Spider-Man duplicates have been around since his inception into popular culture in 1962. Weird Trade Union — Fritz Leiber's Lankhmar stories contain an Assassins' Guild and Thieves' Guild, and so on. The Lankhmar Thieves' Guild was introduced in the second story, "Thieves' House", published in 1943.